This is a military ship, so it's no surprise that it's heavily guarded. 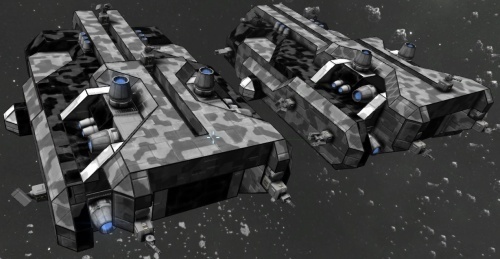 each Turret has an dedicated Small Cargo Container for additional ammunition. There are 5 interior turrets somewhat evenly spaced throughout the entire ship's interior. The specific antenna that spawns drones has a range of 882 meters and is named: "Hostiles detected - Requesting Backup". This antenna within range will spawn either a Incisor or less frequently a Eradicator drone in defense; They are much more formidable with the later being a serious threat, in the unlikely event it spawns. They will spawn 3000 meters away from the player and every 5 minutes up to a total number of 2 drones active any time. This ship has 1 Warhead with a dedicated Small Thruster to detonate it when reverse thrust is fired. The trigger can be seen on the overall map (linked on the right). A good strategy to avoid triggering this is to turn on a thruster and look around the ship to see if any thruster has been turned on. If no thrusters have when you preform this action, then that thruster must be a trap. This will be difficult if you do not have third person view. If the warhead is detonated the ship will be heavily damaged, and you may be killed. The central Large Cargo Container and the interior of the hangar will be lost. 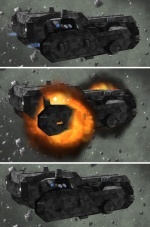 As of v.1.030 (list), the Gatling Turrets and Missile Turrets are functioning and will shoot you if you are moving with more than 3m/s. Best aproach is, so far, to use several decoys (can be real Decoy or any block moving with more than 3 m/s) to distract the turrets. 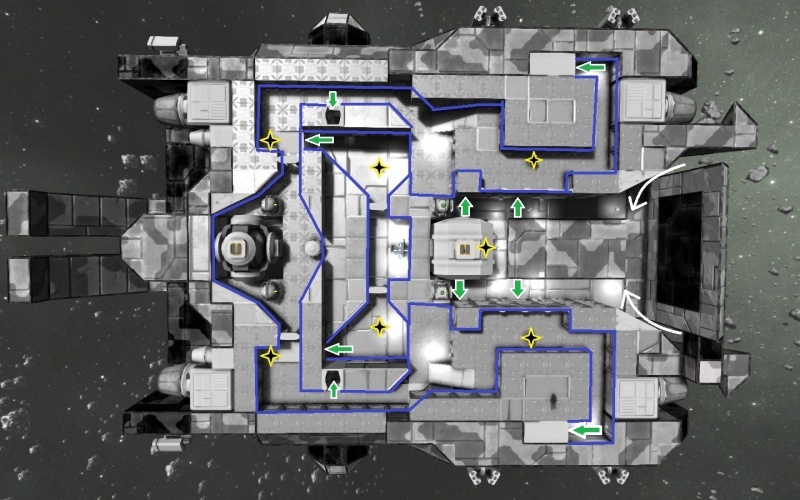 Alternatively you can move exactly in the path of the ship at a distance of more than 800m and activate the Inertia dampeners to keep absolutely still. Short before the ship is about to hit you, match speed with ship. But stay really close to the ship and out of the target area of the turrets. Align yourself in front of the ship( on its course ) at least 800-900m away and stay as dead fish in a barrel. Wait for ship to approach you. Align your ship orientation,so your landing gears face top of transporter - it has few long section of armor, perfect for hard landing. Dust off a bit from Transporter trajectory, just enough for Transporter to fly by without hitting you. Now here is the tricky part. You need to perform hard landing. Turn off inertia dampeners if you have them enabled and engage reverse thrusters, but DON'T exceed 3m/s. When Transporter flies by(it should travel at 10m/s), touch down and lock landing gears. If you perform this properly( don't exceed 3m/s on touchdown) you should land and turrets will target you, but won't fire. Now, use your ship main thrusters to stop Transporter - if you turn on inertia dampeners, speed should be reduced to ~1,2m/s. Once you do, access any panel and kill turrets. Now you have to disarm thurster and warhead. 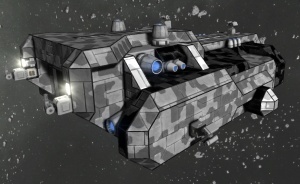 With an exterior made entirely of Heavy Armor blocks with no easy locations to exploit, the Military Transporter is, by far, the most durable target of all the NPC ships. Heavy armor is all-but-immune to small ship weaponry, meaning that advanced tactics must be used. 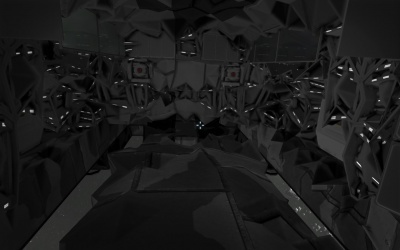 This ship has many ramps inside, but it can most simply be described as having 2 levels. 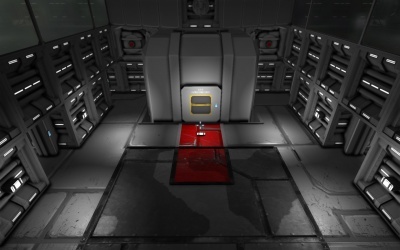 The upper level can be accessed directly through gaps in the sides of a large door made from white and black Heavy Armor Blocks (indicated by white curved arrows). Entry to the lower level can be accessed by using any of the 4 doors in this area, the rest can be read from the maps. 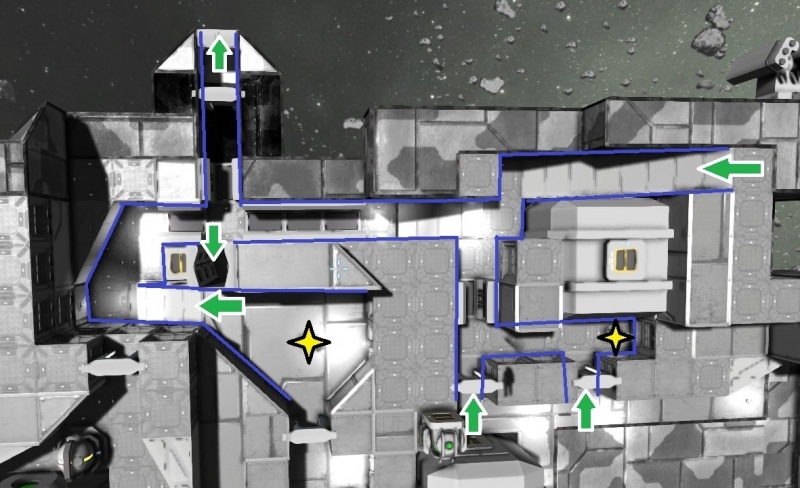 Using this method, you must encounter at least 3 Interior Turrets to reach the cockpit, so I don't recommend it. If entering on the ship's left side using this method, take the first right, go up the ramp, and you'll get shot in the face by a turret. But, then you'll find the ship's cockpit! Access to the thruster is described in the "Trap" section above. When you can access the thruster, use the grinder on the thrusters, at least until they are disabled, then you're ready to go. Alternatively, if you're in a hurry, you can maneuver the ship to where you need it by only applying thrust in a forward direction. This will mean that you need to point the ship away from your destination before you switch on the dampeners. Each of the 3 large cargo containers can easily be raided. 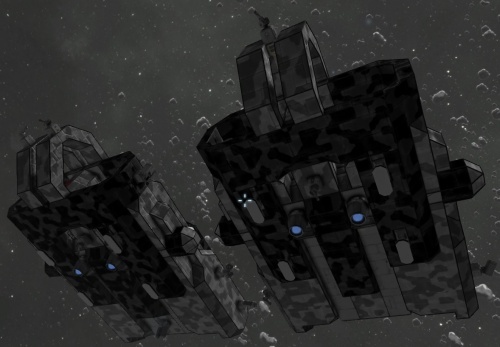 The 12 small cargo containers are near the turrets and hold extra ammunition. New version in front, old version behind.